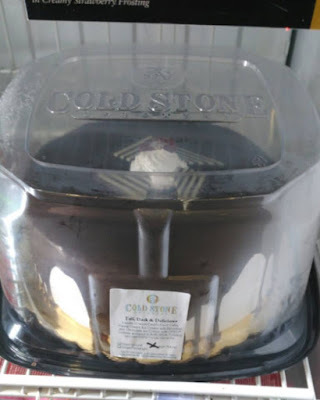 This post is brought to you by Cold Stone Creamery. All opinions are mine. If the Dad in your life has a sweet tooth, then I have the perfect Father's Day gift for them this Sunday! Give them something they can savor and enjoy (and even share!) and a present that won't get stuffed in some drawer, in the back of the closet or returned! 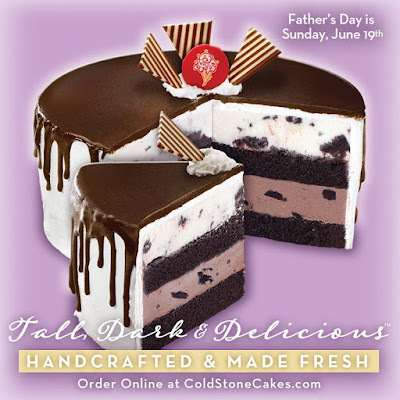 Get that special Dad in your life the Tall, Dark & Delicious™ cake made just for Dad from Cold Stone Creamery! He won’t be able to resist the layers of moist Devil’s Food Cake, Sweet Cream Ice Cream with Brownies & Chocolate Ice Cream with OREO® Cookies wrapped in fluffy White Frosting and cascading Fudge Ganache. Have you ever heard of anything so amazing??!! No dad will be disappointed with this gift!! Cold Stone Creamery delivers the Ultimate Ice Cream Experience through a community of franchisees who are passionate about ice cream. The secret recipe for smooth and creamy ice cream is handcrafted and made fresh in each store, and then customized by combining a variety of mix-ins on a frozen granite stone. Their ice cream is hand-crafted in small batches – one flavor at a time. They start with the highest quality cream, sugar and flavorings to make their ice cream fresh in the back of each of their stores. This small-batch process ensures the customers receive the richest, creamiest, most delicious ice cream when they visit Cold Stone Creamery. So now that your mouth is watering and you have a great gift idea for Dad, hurry to order today! They are in stores or online! You can purchase the Tall, Dark & Delicious™ Ice Cream Cake in stores and online from May 19 – June 19, 2016.